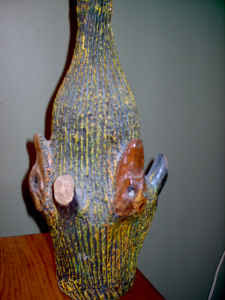 theAd>> Unique Crocodile head decorative bottle. I don't know who made this bottle but I do know that the heads are real Croc. heads! The bottle looks like any ordinary wine or champagne bottle that someone applied plaster to and mounted three, baby Crocodile heads so. "so" the next time you are sittin around with a wine bottle, some plaster, a few croc heads and a BIG bag o'meth I think I have a project for you. Martha would be proud.